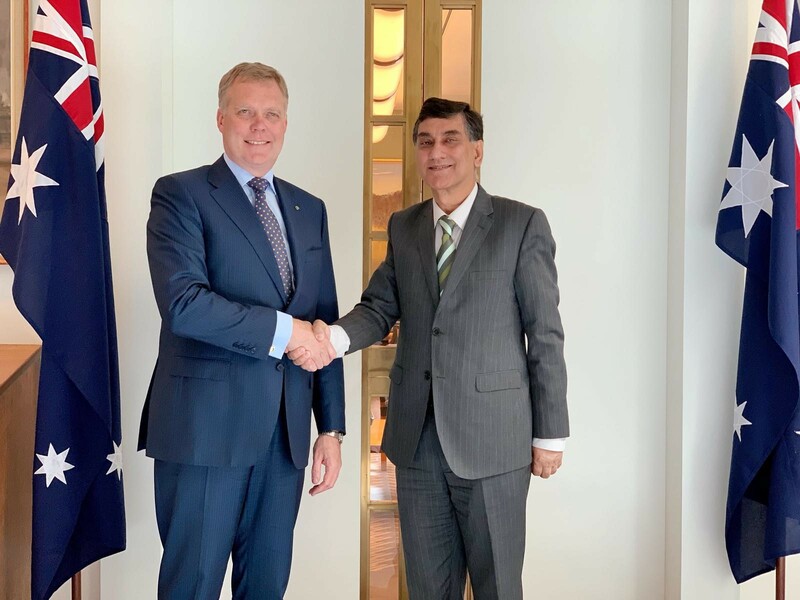 High Commissioner, Mr. Babar Amin met with the Speaker of the House of Representatives in the Australian Parliament, the Hon Tony Smith MP, in his office, today. The High Commissioner expressed satisfaction at the longstanding friendly relations between Australia and Pakistan. He said that Pakistan would like to further strengthen parliamentary relations with Australia. The High Commissioner informed the Speaker that following the General Elections in Pakistan, a new Pakistan-Australia parliamentary friendship group is being formed in the National Assembly of Pakistan. Moreover, the Pakistan-Australia Friendship Group has already been formed in the Senate of Pakistan. He stressed on the need to enhance exchange of bilateral Parliamentary visits between both sides. While agreeing to the need of greater interaction, the Speaker indicated that the earliest such visits could take place would be after the Australian parliamentary elections next year. The High Commissioner briefed the Speaker about the OHCHR’s report on human right’s violations in Kashmir. He expressed the hope that Australia and Pakistan, being members of the Human Rights Council, would work together to support the recommendations contained in the report, most importantly, to form an Independent Commission of Inquiry on human rights violations in Kashmir. The Speaker while thanking for apprising him about the situation stated that the Australian Ministry of Foreign Affairs should be looking into the matter. The High Commissioner highlighted the contribution of the Pakistani diaspora in the socio-economic and political environment in Australia. The Speaker appreciated the constructive role played by the dynamic Pakistani Community in various spheres. The High Commissioner also drew attention of the Speaker towards consular matters of Pakistani community in Australia. While referring to the marked improvement in the security situation in Pakistan, the High Commissioner called for the Australian cricket team to visit Pakistan for a series. The Speaker while lauding the enormous cricket talent in Pakistan expressed the hope that the Australian cricket team would visit Pakistan in future.